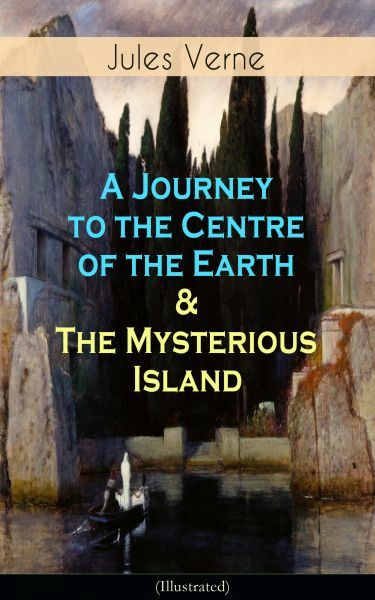 This carefully crafted ebook: "A Journey to the Centre of the Earth & The Mysterious Island (Illustrated)" is formatted for your eReader with a functional and detailed table of contents: A Journey to the Centre of the Earth is an 1864 science fiction novel by Jules Verne. The story involves German professor Otto Lidenbrock who believes there are volcanic tubes going toward the centre of the Earth. He, his nephew Axel, and their guide Hans descend into the Icelandic volcano Snæfellsjökull, encountering many adventures, including prehistoric animals and natural hazards. The Mysterious Island - The plot focuses on the adventures of five Americans on an uncharted island in the South Pacific. During the American Civil War, five northern prisoners of war decide to escape, during the siege of Richmond, Virginia, by hijacking a balloon. During their stay on the island, the group endures bad weather, and domesticates an orangutan, Jupiter. There is a mystery on the island in the form of an unseen deus ex machina, responsible for Cyrus' survival after falling from the balloon, the mysterious rescue of Top from a dugong, the appearance of a box of equipment (guns and ammunition, tools, etc. ), and other seemingly inexplicable occurrences… Jules Verne (1828-1905) was a French novelist, poet, and playwright best known for his adventure novels and his profound influence on the literary genre of science fiction.